Boulder Peak is the highest summit within the Marble Mountains, a P2K and a member of both the CC and WSC lists. This would be my first visit to the Marble Mountains, found fairly far north in the state and a six hour drive from home in San Jose. There were a number of other peaks in the area I planned to visit as well over the course of a 4-day road trip, but this would be my first stop. It was after 9p before I left home, having spent the evening watching my daughter's VB team lose to a cross-town rival. I had napped in the afternoon and fueled up with caffeine as I started north, driving until 2:30a when I reached Yreka. I found a place to park in an industrial part of town (a rather poor choice, it turns out), up around 7:30a the next morning. I stopped for coffee (I believe the Yreka Starbucks is the only one for more than 60mi in all directions) and a last minute grocery item before heading west along SR3 and Scott River Road, eventually ending up at the Boulder Creek TH after 9a. It was not an early start, but then it was not an overly difficult outing, amounting to about 5,000ft of gain over 13mi, taking some 5.5hrs to complete. Two weak storms had brought some snow to the area over the past week but the weather was clearing and a warming trend was due. Still, it was 34F when I started up the Boulder Creek Trail that starts around 4,000ft. The trail is easy to follow, used more by horses and cattle than by hikers, it would seem. The first hour is spent hiking through forest to reach the Marble Wilderness boundary, with few views until Boulder Peak comes into sight around mile 4 after gaining 3,000ft. 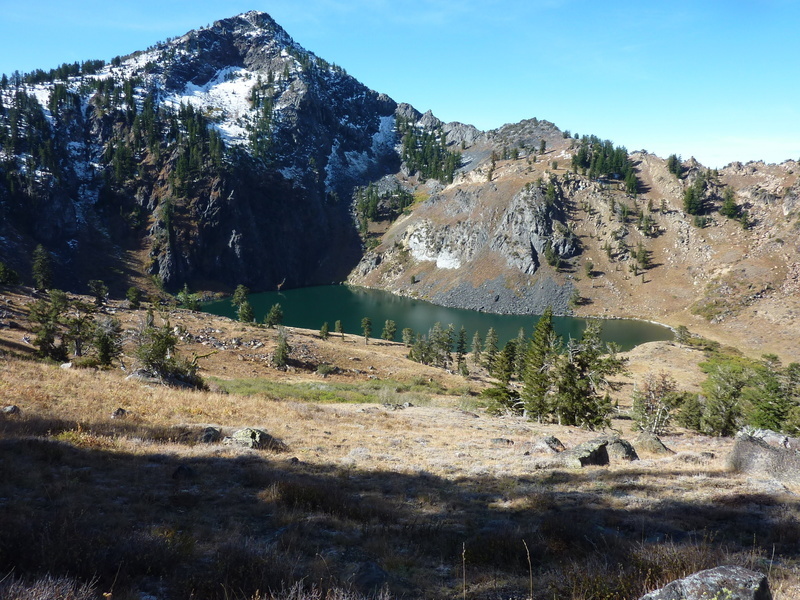 Lower Wright Lake is found nestled at the base of the peak on its north side. Cattle were found loitering around the meadows below the lake, marring an otherwise idyllic scene (caution should be exercised before drinking any of the water from Boulder Creek or vicinity). The trail continues up past the lower lake, skirting Upper Wright Lake and eventually reaching the crest about a mile northeast of Boulder Peak where a trail junction is found. 1-2 inches of snow covered the last quarter mile of trail. I turned north at the junction to climb the only bonus peak in the vicinity, unnamed Peak 8,020ft about a half mile of easy cross-country from the trail junction, taking about 40min for the side trip. Back at the junction, I continued along the trail labeled "Boulder Peak" to the southwest. This trail forks at an unsigned junction not long afterwards. I took the right fork which heads uphill (no idea where the left fork goes - down to the PCT, maybe?). I followed this trail nearly to the summit, but for some reason it bypasses it by several hundred yards to the south. A modest class 2 scramble up and over a false summit will shortly get you to the highpoint at the north end of the mountain. As one might expect from a summit with more than 2,000ft of prominence, the views are quite expansive. The three most notable sights are Mt. Shasta to the east, Mt. McLaughlin to the north and Preston Peak to the northwest. Closer in, about 5mi to the southwest, can be seen the remarkable Marble Rim formation for which the range and wilderness are named. It looks to make for an interesting traverse and would be the goal of the next day's efforts. A register left by Richard Carey in a set of nested cans was rather busy, filling almost two books with hundreds of entries over the past 13 years - this one is quite popular and had far too many pages for me to bother photographing (it didn't help that the books had been repeatedly wetted, were moldy and difficult to read).